Sydney Uni Women’s College has been undergoing major construction and refurbishment works – it’s first in over 40 years. 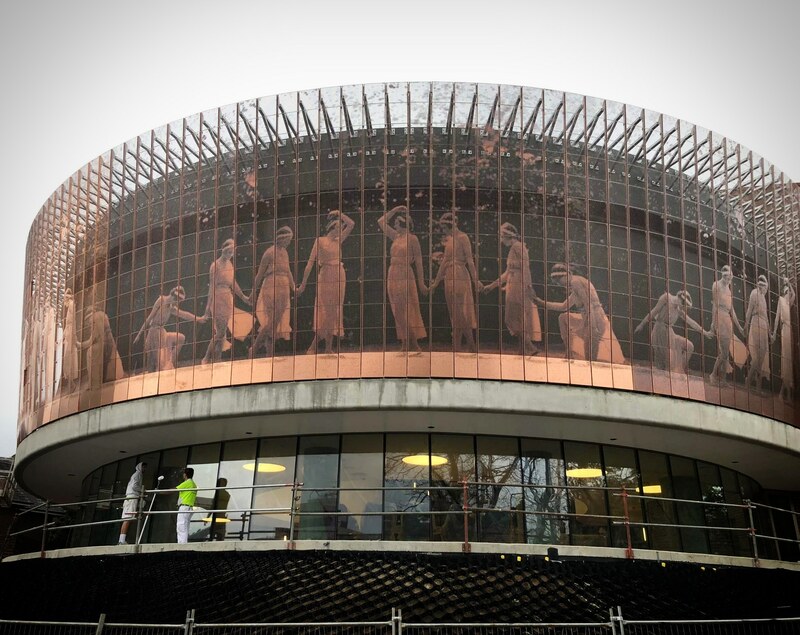 Part of the works – known as the Langley Precinct project – involved the construction of a curved facade containing 1,200 perforated copper panels that display a historical image. Tensile’s job was to create the supported mesh facade for the panels through a design-and-construct contract. This project is more than just a renovation. The residential college has always embraced equal opportunities in education for women – even in the 1890s! – and aims of this development include enhancement of the university’s reputation for excellence and equality. The Sybil Centre – includes areas for socialising, a new library, tutorial rooms, study spaces, light-filled areas for art and architecture students, sound-proof music rooms, a rooftop terrace, and connectivity to the Langley garden plaza. Langley residential building – renovation of the building includes the addition of contemporary living spaces, guest bathrooms, improvements to common rooms and new tutorial rooms. Langley precinct – involves creation of three new gardens, a new staff residence, car-park facilities and improved security. 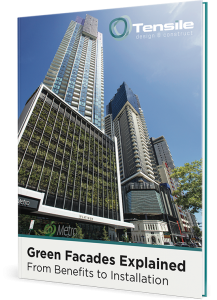 Companies involved in the project include builder AW Edwards, architect m3architecture and PerfTech, the creator of the copper panels. Our goal in designing the mesh for the panels was to ensure the historical image (the figure of Sybil, representing female wisdom and foresight) was not diluted in any way by the supporting structure. 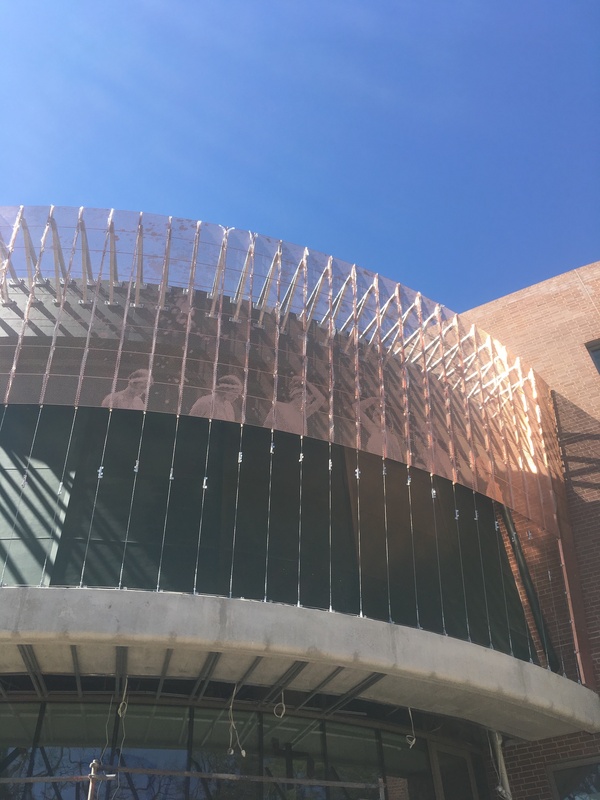 The perforated copper panels are supported on Tensile’s 6mm diameter cables, in a custom-clamp arrangement. The method and material maximise transparency, giving the image the desired ‘floating’ appearance. The facade was first modelled using a 3D program, to ensure the correct geometric curve and gradient would be reflected in the finished structure. Tensile specialises in designing facades of this kind. They can be designed for safety, greening and artistic purposes, depending on what you want to achieve. Get in touch if you have a project you would like to discuss.